From Mt Hotham the Alpine Track climbs over the Twins but the climb is well rewarded with magnificent views back across Blowhard Ridge to Mt Hotham, Mt Feathertop and the giant cleft of the Ovens Valley running into the blue-hazed ranges beyond. To the north-west, the distinctive shape of Mt Buffalo lies across the horizon like a sleeping – well – buffalo! To the south, ridge after forested ridge stretch to the infinitely distant Snowy Range while to the west, the Barry Range runs like a spear into the hazy blue distance, marked here and there by a fire trail. Along the Dry Barrys the track follows the ridge top of the Great Divide to eventually climb over the fabled Viking – a climb that is as spectacular as it is hard. Beyond The Viking lies the Razor and Mt Speculation. From Mt Speculation there is another spectacular panorama from the Viking and Razor in the east to Mt Cobbler, shaped like an Indian head, to the north-west while to the south lies the sawtooth of Mt Buggery and the Crosscut Saw with the broad flat dome of Mt Howitt beyond. 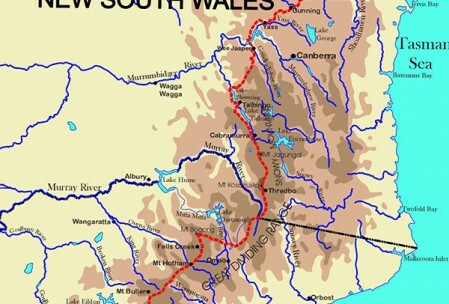 From Skene, the track cuts across the grain of the country with steep descents (and following ascents) to the tree-ferns of the Black River, the shafts and water races of the old Jordan River Diggings and the Upper Thomson Valley with its portal and weir! Another easier climb brings you to Stronach Camp where the burnt logs of the 1939 fire were salvaged in a milling operation that lasted over 20 years! 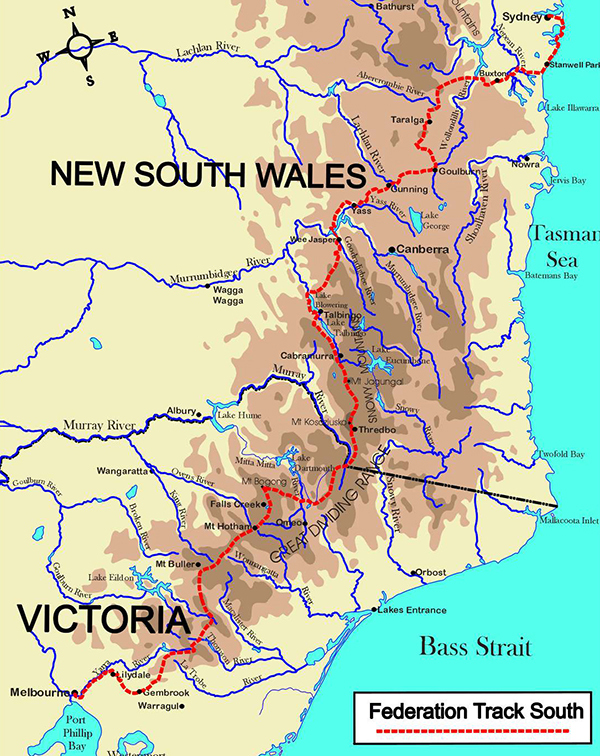 The track then heads south along the Baw Baws but at Mt Whitelaw the Federation Track leaves the Alpine Track and heads west along the Upper Yarra Track to Toorongo Picnic Area. Before the 1939 fires there was a town here with sawmill, office, store, houses – all built of timber. Now the once thriving timber towns of Toorongo and Myrhee are just clearings in the forest.